Dubai: Vehicles registered in Dubai will soon have number plates with new designs as the Roads and Transport Authority (RTA) is working on plans to replace the existing designs and colours, Gulf News can confirm. A senior RTA official told Gulf News that the authority is currently studying various designs and considering a new colour coding system for vehicle number plates of all categories but nothing has been finalised yet. However, he revealed that all new number plates will bear the new Dubai logo, without divulging what the new logo will be. He added that a specialised team is currently in the final stage of completing the study and the details of the new plan will be made public in the next few weeks. Number plates in Dubai haven’t changed for decades. 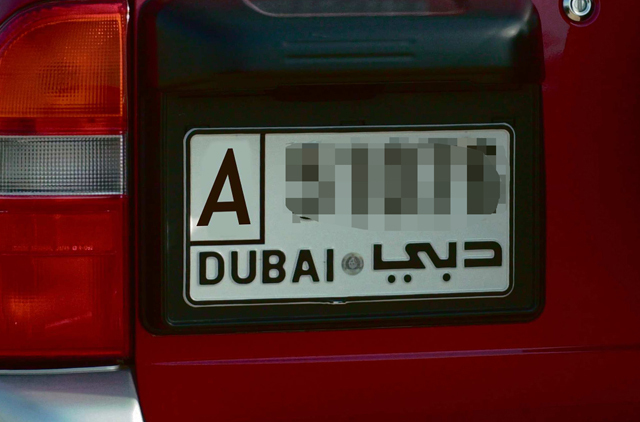 Private vehicles registered in the emirate have white plates with numbers in black, while commercial vehicles have green plates with white numbers. Recently, RTA launched number plates for classic cars, which are maroon in colour. Classic cars were not allowed to ply on Dubai roads for lack of testing facilities until early 2012; however, with the new facility, many of these vintage beauties which were earlier confined to showrooms and garages are now back on the roads. Last year, the authorities also launched personalised number plates with images of Burj Al Arab, Burj Khalifa and other Dubai landmarks. Earlier this year, RTA also revealed that they are considering introduction of smart or electronic number plates, which could help improve road safety, apart from having other benefits. The smart number plates were on display at a transport exhibition earlier this year in Dubai and RTA had confirmed to Gulf News that it could be considered for the future. Among the features of the smart plate is that it controls the speed of a vehicle according to the limit on a particular road, which could help improve safety, particularly on internal roads. Other benefits of the technology are integration with RTA’s Salik, storage of data that can allow authorities to track movement of vehicles and identify criminals, auto deduction of parking fees, while also easing entry to and exit from parking areas, without the need to swipe cards. Currently, RTA number plates cost Dh50 and it is not yet clear whether the new number plates will cost the same or more.